Holocaust survivor David Tuck and his family were deported to a ghetto in 1939. He spent the next five years in the concentration camps Posen, Auschwitz, Mathausen, and Gusen II. He was asked his opinion of recent comparisons between US immigration policy and actual concentration camps he'd experienced. "In our town we only had but 18 Jewish families. First the Nazis gave us to wear yellow armbands on the left arm. Then they gave us a Star of David, one on the front and one on the back. If you walked on the street on the same sidewalk that the SS man walked, if you didn't step down they would kill you. "If I had any piece of bread at night with me, if somebody knew about it they would steal it from me. Everybody was for themselves. Survival. There were times at night I used to go to sleep, I would say 'Please G-d, let me see the light the next day. Many times." "I didn't believe it myself, I made it. I made a commitment I'd never forget, never forgive what they did to me. But I don't live with hate." Asked by the interviewer, "To someone who thinks that America runs concentration camps on the border, can you give them a message, as someone who experienced a concentration camp? ", Tuck answers, "Grow up. You know how to spell, you know how to read, how to listen; do it. You can't compare it; any time I hear it, it's sickening." The interviewer asks, "What about the term, when people call Donald Trump, people call other political opponents 'Nazis', what do you think about that?" "It's sickening," answers Tuck. "It's just plain sickening. I thought we were smarter than that." Former Central Intelligence Agency and National Security Agency Director Michael Hayden compared the Trump administration’s immigration policies to Nazi Germany. Hayden wrote: “Other governments have separated mothers and children” under a black and white photo of the front of Auschwitz as seen from the railroad tracks approaching the Nazi extermination camp. 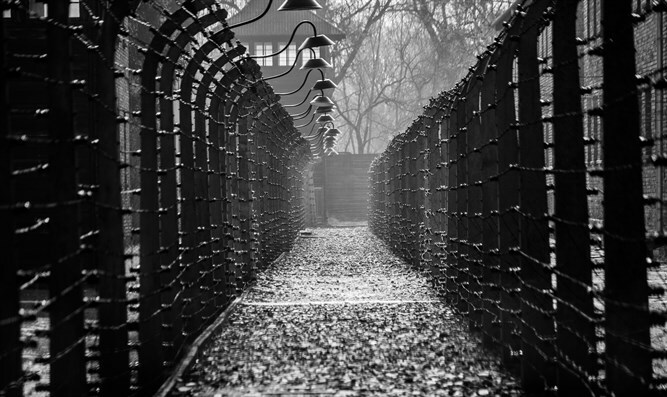 According to the United States Holocaust Memorial Museum website, "It is estimated that the SS and police deported at least 1.3 million people to the Auschwitz complex between 1940 and 1945. Of these, the camp authorities murdered approximately 1.1 million." Some attack the very premise as ridiculous or obscene. Alana Mastrangelo tweeted "I just told my grandparents (who once lived under Mussolini) that people in the US think Trump is a fascist. They laughed so hard, they cried." Conservative commentator Ben Shapiro tweeted "Trump opponents keep comparing Trump immigration policy to Nazi policy. Read a damn book, you idiots."